Over the years the 9000 has developed from the first launch in 1985 to become one of the Classic models of the later part of the century. From the normally aspirated fuel injection models through to the Turbocharged versions, all can be seen regularly at the Club meetings. A design sketch by Bjorn Envall, the Chief Design Engineer, was the basis of the new design and the 9000 project was born. Using this basic sketch as a pointer SAAB-Scania opened the design to competition between its own designers and a number of specialist firms within the motor industry, the winning design on which the car was based was by Italdesign. The market research had identified the type of model wanted by the consumer, the engineers would define the limits of the design and a financial analysis would define the costs that would be incurred in production. The national governments would have their say on conformity and safety standards. So what about the designers? You could ask yourself whether the designer and his concepts actually play a major part in the development of a new car. The design of the 9000 started from the inside, the needs of the driver and passengers accommodation were defined, then the styling of the exterior determined, ensuring maximum use of the shape. Extensive sketches and drawings were created by the designer to achieve the desired concept. These would then be presented to the technical and marketing specialists. Subject to approval they would be transformed into a scale model, then into a full size mock-up built onto a steel chassis. A full size model of the car would be produced in polystyrene covered in clay to form the final shape before being finished with a painted foil covering. The finish is extremely important as the model would then be wind tunnel tested. Further detail adjustments may be required before a new model is made from which the tooling for the new car is produced. The creative process produces a wide range of alternatives such as interior fittings which after selecting the one for the car would be kept for further developments and possibly used on further models. “I think the car is sensual and has attractive lines… although I would have preferred a somewhat more aggressive rear. Nevertheless, it is a shape which is capable of further refinement! 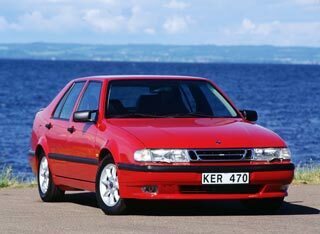 The 9000 eventually appeared in 1984, 10 years from concept to reality, Bur Ralf Jonnson’s comments above resulted in the CDE, the saloon version and in 1991 the CSE with new front and back end styling.